Ahhhh, Slickrock. Considered to be one of the best and most unique mountain biking trails in the world, your tires grip the sandpaper-like sandstone perfectly, making it possible to ride angles you never thought possible. Even though it’s only 10 miles long, the steep ups and downs are an aerobic workout that can tax even the most fit. You’ll see Jeep tours scaring the s*^t out of their passengers. You can ride the loop in either direction. Lately, I’ve been riding counter-clockwise for a different perspective on the Colorado. However, having ridden in both directions several times, I do think clockwise is best for the long beautiful descent from the peak at mid-point. When you do get near the peak, you’ll have a chance to go slightly off trail for great picture taking opportunities. There is a 2.3 mile Practice Loop for folks to try out and get a taste. Cris ran that portion while Kyle and I rode the main loop. Bring lots of water and sunscreen, particularly in the late spring, summer and early fall. You’ll also need to pay a fee to enter the Sand Flats rec area. After our Kokopelli bike trip, we spent several hours hiking through Arches National Park in Moab, UT. It’s a truly magical place with towering red rock all around. The park sits on an underground salt bed, which is what contributes to the formations. Salt under the deep “Entrada sandstone” sediment has shifted and in areas collapsed, and other portions are thrust upward. There are over 2000 arches within the park, and they range in size from a few feet to over 300 feet with the Landscape Arch. After Landscape Arch, we hiked up a bit of exposed rock to see Partition Arch and Navajo Arch. A short distance from Navajo Arch is Partition Arch, offering a great view of the park below. We only spent a few hours in the park due to the heat, and will return and explore other sections. After much thought and discussion with Cris, we decided to call it and head to Moab by car on the highway. Water would be difficult to find between here and Moab, and we had at least one tent overnight in front of us. The BLM road that the Kokopelli follows was sketchy, we had already bottomed out in the Highlander on a big rock, and Cris noticed the left front tire was significantly low on air. Also, I didn’t want to completely fry Kyle with the biggest climbing of the whole trip. We had achieved our objectives of trying out all our gear and testing our fitness, and we knew we had many rides to do before we attempt the CT in July. We loaded the car, and headed down to Dewey and onto Route 128 through Castle Valley to Moab. It’s an incredibly beautiful drive. For fans of the HBO series Westworld, this is where many of the outdoor scenes are filmed. We decided in the car to make the most of the Kokopelli, and drive to the top above Moab where we’d be had we continued. We could then fly down it, as it’s all downhill into town. When we got to the trail head, we found that the segment from Dewey (La Sal Loop Road) to the same place was closed for construction. We wouldn’t have been able to get up to this point even if we tried! We geared back up to see what it would be like bombing down with all the weight, and set off. I have done the neighboring Whole Enchilada trail many times, but never the Kokopelli road down to Moab, and I’m glad I did. Although it’s not singletrack, the trail winds through a beautiful canyon and provides brilliant views of both the snow capped mountains and red desert rock below. It was only an hour or so before we got to our hotel in Moab, and it was so refreshing to shower off three days of desert dust and grime. We then headed out to snarf down a huge Mexican lunch, and discuss what we learned from our trip. First, we need to manage water better for desert rides. This won’t translate directly to the CT, as on that trail we are riding above 10,000 ft for most of the ride and will come across many running streams and snowfields. We will have those water points mapped on our iPhone so that we don’t have to carry 4L of water unnecessarily. Second, we must trim some pack weight. We’ll go through our packs in the coming weeks to see what we can yank. Third, we need to get more fit. A few days after we got back home Kyle walked in from school and said to Cris, “We’re going out for a ride.” It was horribly windy that day, with 40+ mph gusts, and Cris said, “In this wind? ” Kyle replied, “It’ll be like that on the CT. We need to go.” We both went out and battled up the local hill, passing several others. It was the hardest ride I’ve done on that hill in 15 years, but when we turned around we had a fun fast ride with huge tailwind. We both got up to 42 mph on the bikes based on our GPS tracker. We’ll go back and do the Kokopelli some year, maybe next, and we’ll probably start in Moab to get the big climbing in when we’re fresh. Our first overnight on the Kokopelli was restless. After midnight a big crowd of campers arrived and set up shop noisily. Also, we found our Thermarest pads emitted a “crunchy” sound every time one of us turned over. However, we woke to the sound of cows mooing all around us, which was pretty cool. I got up, heated our water for coffee and oatmeal glop, packed our bags and we got on our way west. We had 15 extra miles to make up from yesterday and get to Dewey Bridge to meet Cris. We made pretty good time in the morning with fresh legs, almost no wind, and low temps. 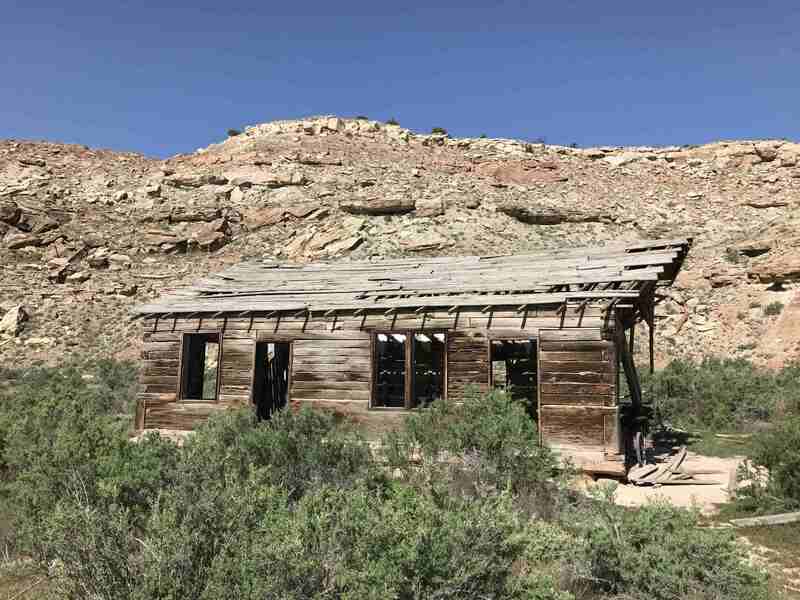 Heading downhill to the river, we came upon an abandoned house which looked to be an old mining shack. Then, we then came upon a set of railroad tracks and disturbed some bird, a turkey I think, that flew up right in front of us and then ran along the tracks. We couldn’t stop laughing as we crossed the tracks and headed into the station. As we sat down to rest, a woman approached us and asked if we were doing the Kokopelli, and then proceeded to warn us about a local rancher who had erected barbed wire fencing across the trail at several places. She was a local who rides the trail often, and a few weeks ago hit one of those wires, flew off the bike, and broke her arm and several ribs. I’ve read about malicious spikes on trails left as traps, and wondered if we had an issue. We thanked her and went over to station to find where we could refill our water supplies and met a ranger named Bob. I asked Bob if we had an issue ahead, and he said, “No, the rancher just wants to keep his cattle contained. You’ll see them far in advance, and just put the gate back in place when you cross over his land.” Bob then unlocked the spigot for us, and we topped off our water supplies. Trails which go long distances often pass over private lands, and I believe it’s best to tread lightly over those passages. If we cyclists can do that, then we’ll be able to get more of these epic trails constructed. Sure enough, we had no problem seeing the fences in advance, opened the gates, and put them back in place once as we passed. Once we left the ranger station, the hot winds again picked up as they did the day prior. 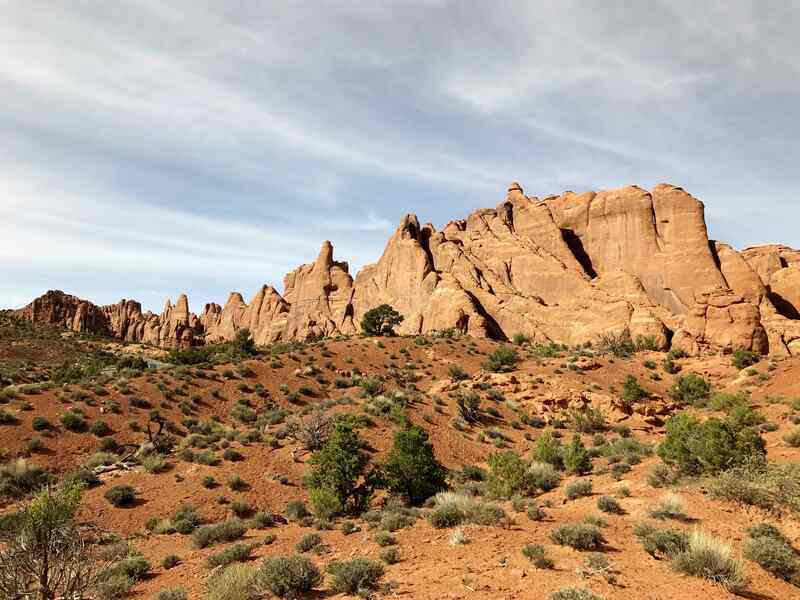 Soon we began to see red and white land formations characteristic of Moab. And as heat kicked in, we sought refuge under whatever brush we could find. We encountered some difficult climbs and hike-a-bike, and I could tell Kyle was wearing out. Finally we got to Dewey Bridge. The beautiful wooden bridge was built in 1916 was destroyed by fire from a young child playing with matches. We met Cris, and she brought us delicious fried chicken and Gatorade. Yum! I had hoped we would have the energy to start the climb out of Dewey and get a camp site with a view, but Kyle was kaput. So, we put the bikes on the car and drove up the Top of the World Safari Route as far as we could in the Highlander and found a nice place to set down. As nightfall hit, Kyle got a few spectacular pics of the stars. I had a lot to think about and whether we could or should proceed. Even though we had a good 40 mile day, Kyle was spent, and the biggest climbs of the ride were in front of us. Also, water was a huge problem – there were few, if any, viable streams to resupply between this point and Moab, and the roads were too rutted for Cris to get to us in the Highlander. But at least the wind had died down, and since we were both exhausted, sleep came quickly. On Thursday we were up at 5:00am and on the road by 5:30 as planned, and by 10:30 we had the bikes loaded and ready to go. As we climbed up out of the parking lot, Kyle was awed by the scenery and immediately the photo snapping began. 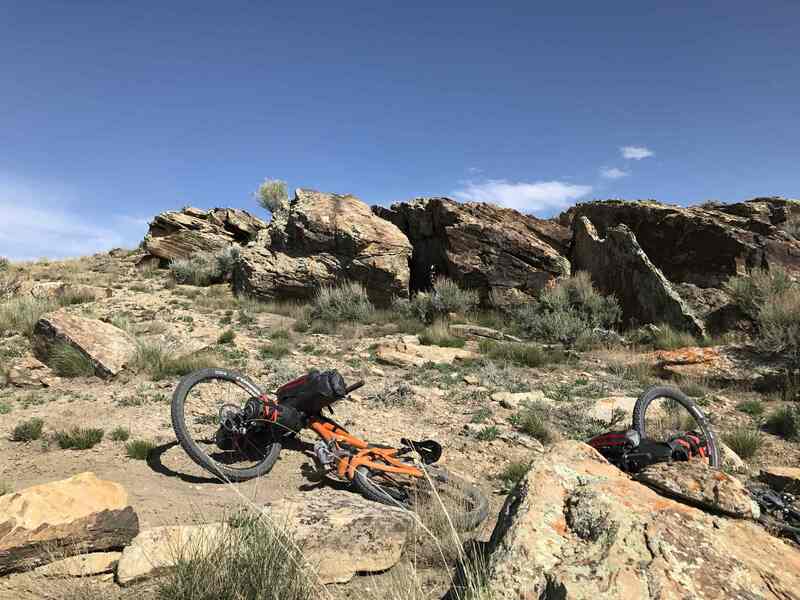 There is some exposure along Mary’s Loop in Fruita, and I was nervous about how Kyle would handle that, particularly with the weight of the bikepacks, but he handled it without any issue. He’s done some climbing with friends in Boulder, and I think that’s helped him get accustomed to heights. The spring flowers of the desert were starting to become plentiful. As we left Fruita towards Salt Creek in the early afternoon, we got to some of our first serious hike-a-bike. As the afternoon wore on, it go hotter, and the winds really picked up. Soon we were battling 20 mph hot winds consistently, and we took shelter wherever we could. At the top of the hike-a-bike section, our navi said we had a long downhill, but noooo. We pedaled hard into the wind, which negated all the benefits of the descent. We had hoped to get to the Westwater Ranger Station which was 15 miles away, but were completely out of water. Since we were close to I-70, we had four bars of cell coverage. I called Cris who was staying in Fruita, and she thankfully brought us water and some awesome burritos. We pitched camp at Rabbit Valley in Mack, CO.
We discovered others at the campsite. As the sun went down, we got out the cameras and tinkered with tent lighting photos. This was mine, shot on my iPhone 7+. This was Kyle’s, shot on his Nikon DSLR. I think he won. The next day would be a big one, hoping to make up our mileage to Westwater, and then down to Dewey Bridge and to start the serious climb to Moab. To get ready for the CT, we knew we needed to do a big multi-day bikepack ride beforehand in order to test out our gear and fitness levels. We picked the Kokopelli Trail which links two of my favorite places, Fruita, Colorado and Moab, Utah. 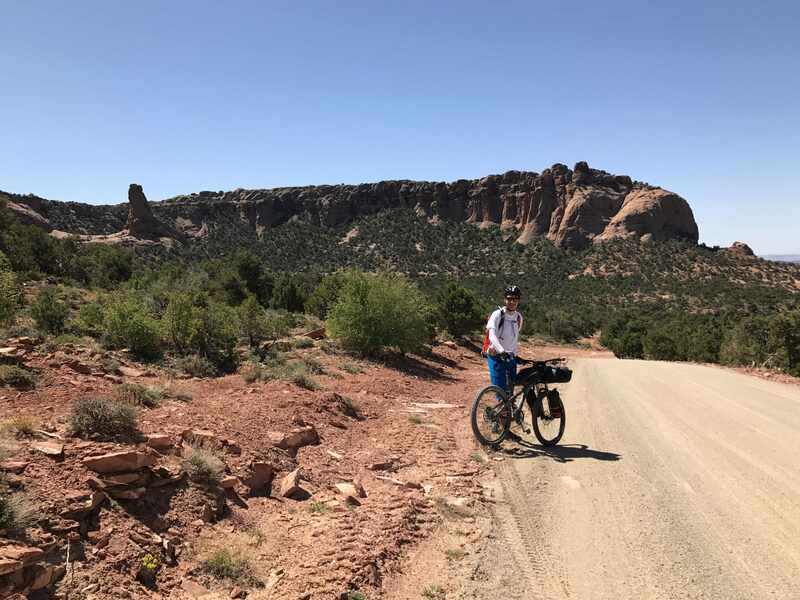 Although there’s singletrack in Fruita, the route is mainly connected jeep roads and was created by the COPMOBA (Colorado Plateau Mountain Bike Association) back in 1989. It can be ridden in either direction, but needs to be done in the spring or the fall because there’s snow in the La Sal mountains above Moab in the winter, and the heat is brutal in the summer. We decided to do the trail in April over Easter weekend when Kyle had a four day weekend off from school. Kyle and I have been prepping for the CT for several months now and it was time to assemble our gear. Last Wednesday I pulled my stuff together, put it on the scale, and the breakdown was as follows. Total was 57.5 lbs, which is a little heavy. My goal was to have the bikepacks plus backpack plus water total no more than 20 lbs, but we were at 29.7 lbs. One of the things that weighs so much is our electronics. We are doing the CT primarily for the photography and videography opportunities, and so I’m carrying a GoPro Hero5, Karma gimbal, iPhone 7+ for navigation and still pictures, an Anker solar panel, and a backup Anker battery. That set of gear probably weighs 5 lbs itself. I decided to throw caution to the wind and go for it. I used to carry 60+ lbs on my back when hiking and camping back in the 90s! Kyle got home from school in the afternoon, pulled his gear together, weighed it and it was roughly equal to mine. So we loaded up the car and got to bed early to be able to get up a 5am and be on the road by 5:30 next morning with Cris for Fruita. Today I led a big crowd up to Mallory Cave from NCAR in Boulder. It’s not a particularly difficult hike, but at the top to get to the cave you need to scramble up a rock face that has only a few hand and foot holds. you climb just a few more feet up to the cave. The cave itself is home to Townsend’s big-eared bat, but because of an outbreak of a fungal infection in the bat population, it was gated off by Boulder in 2011. It’s a shallow cave, and I didn’t see any bats or robins. Turn around that this point and you have beautiful views of NCAR and Boulder beyond. Thanks to the whole Hiking with Geeks crowd! As I noted in my blog post, our first attempt with our Zpacks Duplex and inner carbon fiber poles didn’t go so well, but with Joe Valesko’s help (the owner/founder of Zpacks) we received the Duplex Flex Tent Upgrade a few days ago. Essentially this is four Easton Carbon Ion poles which weigh just 10 oz and span the outside of the tent. Kyle and I set up the tent on the side lawn today. This tent is constructed of cuben fiber (no, not Cuban) which was used for the sails of the winner of the 1992 America’s Cup. The material is quite durable, ultralight (the whole tent plus poles and stakes is around 2 lbs), and of course makes the perfect sail in windy conditions. Just as we started the setup, several gusts of wind hit which made for perfect testing. We properly staked the tent down, got inside, and are happy with the results. Most of all, we are ready for the Kokopelli, and for me, a Mojito. I’ve completed the Colorado Trail, the Collegiate West section of the CT and CDT, and several overnights in the Indian Peaks wilderness area since I wrote the above post. I can say I love my ZPacks Duplex! It’s saved my bacon in several rainstorms. It’s a sharp looking tent too, and I get many questions and compliments from other hikers. Here are some additional pictures. In the 18 Road set of trails, right next to Zippity Do Da is Joe’s Ridge. It’s not as steep as Zippity, but offers lots of fun ups and downs with great western views. Like all the 18 Road trails, you can ride up the main road, and then for Zippity and Joe’s turn left at the top, then a right a hundred or so feet. You’ll have some stunning views. After a short bit of hardscrabble climbing, you’ll be rewarded with a fast and fun set of roller-coaster rolls with awesome views of the valley below. Joe’s will veer left across Kessel Run, but instead, I would take MoJoe which gives you another mile plus of riding. I love to hike, and a few months ago I joined Meetup looking for other hikers in the Denver/Boulder area and came upon Hiking with Geeks. I did my first meetup hike in Denver and met Mendel Kurland from Austin, TX who created the group and has expanded it to several locations in the US. The idea is for technically minded people to get out into the woods for some exercise and great views, and network along the way. It’s brilliant and has been growing like a weed across the country. For more info on Hiking with Geeks, check out Hiking With Geeks lures nerds into the great outdoors. Mendel and I became fast friends, and I’ve hosted a few hikes including one yesterday to the top of Bear Peak in south Boulder. I couldn’t help giggle a bit when I saw that elevation profile! On a beautiful sunny day between spring storms, the group showed up to hike one of the most difficult hikes in Boulder. With nearly 3000 of elevation gain in only 3.5 miles, it’s stair climbing for 2 of those miles. We hiked through a cool burn zone with twisted, gnarled trees surrounding us like something out of Harry Potter. Finally we hit the top for great views of Boulder and the front range. If you are in the Denver/Boulder area, check out Hiking with Geeks.